This concrete bench is one of two such seats on Limestone Ave. The benches with plaques mark an avenue of native trees planted by the Australian Natives Association in 1928. The bench here is in dire need of restoration, but the thousands of motorists who speed past each day seem oblivious to its fate. 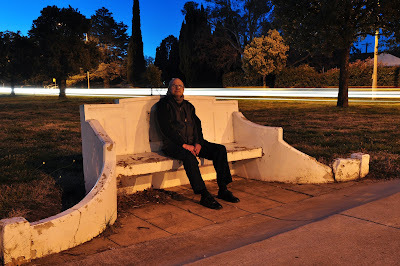 While setting up this shot, a local resident passing by stopped to ask about the long exposure shots I was taking. He was pleased to pose on the bench for this photo. Thanks, Henry! Henry sure enhances the look of the bench.